1- American Eagle, it's not just for jr. high kids- ladies, if you aren't shopping at American Eagle/Arie you are missing out! I have had my eye on this chenille sweater for a while and when it popped up on major sale, I knew it needed to come find a home in my closet. I love it so much in fact that just this morning Scott said to me, "You look so pretty today, wait, didn't you wear that sweater yesterday?" Why yes honey, I did in fact wear this sweater yesterday, but I'm seeing all different people and therefore it doesn't count. Does anyone else live by this mentality!? 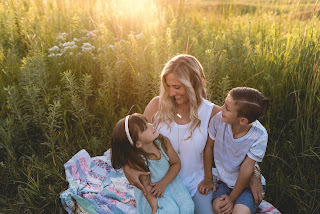 Linking up a few of my #momuniform favorites, including the best cami bra ever if you are also part of #teaminflated ;) AND the best Amazon knock-off Zella leggings ever! 2- This make-up organizer is a GAME CHANGER! I know that SO many of you have been watching Tidying Up on Netflix and while I haven't jumped on that train yet, I always get the organizing itch in January! 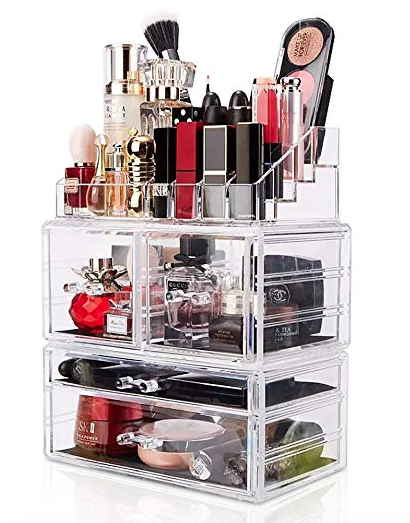 I found this one on Amazon and it is the perfect size, I don't have a ton of make-up and it fit everything I had without a ton of unused spaced, but also left me a little room to expand too. 3- Speaking of make-up, I have seen so many beauty bloggers mention mascara primers and I finally remembered to grab this drug store find while at Target this week. Overall, it definitely helped my mascara stay on my eyelashes instead of my eye lids and made them appear slightly thicker. I don't know if I feel like I need to wear it every day, but if I know I'm going to be out in the real world all day into date night, etc. I would definitely put it on! 5- Last but not least, I'm always looking for a quick snack option when I'm on the go with my little ladies, have you ever tried to wrangle three children while #hangry!? I have and it's not pretty! I am obsessed with these Power Crunch Protein bars, they taste just like a Nutter Butter, but since it says Protein on the label, that makes it healthy, right!? 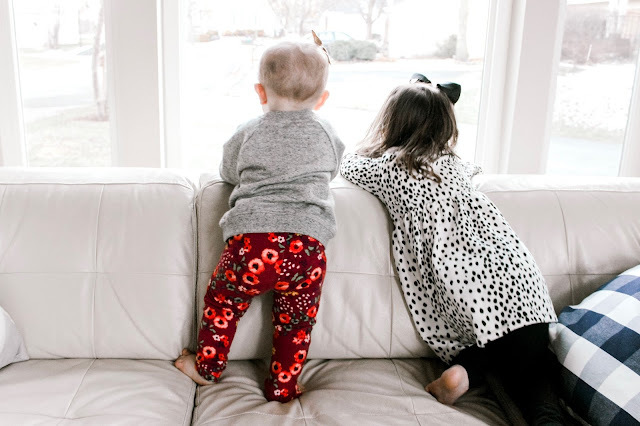 6- BONUS: Did you see that I started a new blog series this week!? Snyder Family Co. coffee chats! I had the BEST time interviewing one of my sweet friends Marjorie about what's it's like to be a busy Mama who is also running a small business, if you missed it, you can read it here: Snyder Family Co.: Coffee Chat ft. Marjorie . Also, if you would like to be featured in a future chat, email me at brittany.snyderfamilyco@gmail.com, I would LOVE to chat with you! Have the best weekend friends! I'm happy to report we have a few things in our schedule for this weekend and we are looking forward to a weekend FREE of germs!! 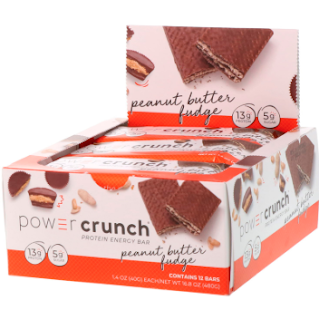 Be sure to share some of your favorites from the week with me, I would love to know what your go-to snack is! I love American Eagle. I also love that primer. I do use it almost every day and love it. I pair it with the mascara and it is so good! I am loving the primer, I didn't think I would reach for it every morning, but I think it's going to become part of my daily make-up routine! The voluminous mascara is my favorite. I've tried others and keep going back. I'll have to try adding the primer. Have a great weekend! Lisa, I was only using the mascara too, just wait until you add the primer, wow! Love that I can get it at Target or Amazon too without breaking the bank, have the best weekend! Ha! This comment made me giggle, totally odd girl out too with my double stroller and five-year old walking next to me! But, their sweaters are so soft and the perfect length! Try out the primer, it's so cheap and I really do think it makes a difference :) Also, Valentine's Day is coming up... maybe drop someone a hint hint for that organizer!